When the power goes out unexpectedly, your business risks losing important data and productive hours of work. By getting a generator, you will make sure that your system is up and running quickly. The right system may even be able to provide a seamless transition between main and backup power sources. Of course, productivity isn’t your only concern. 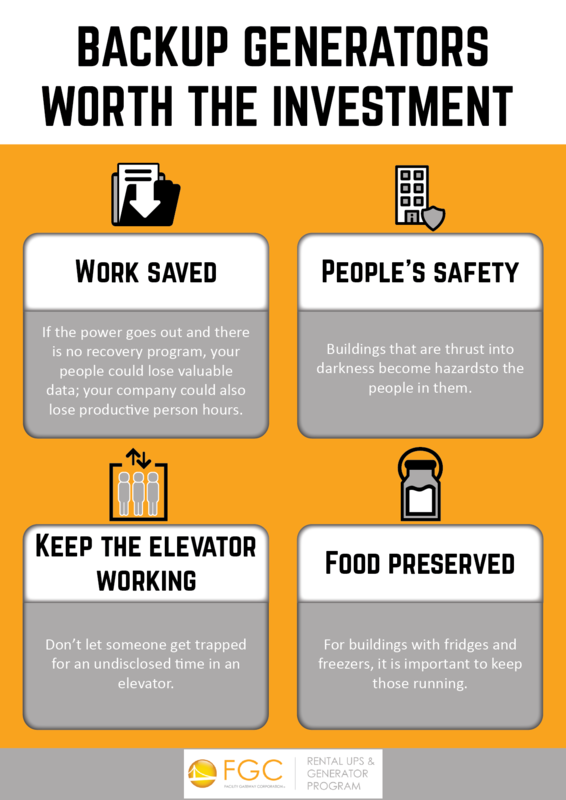 Employees and customers need to be safe, and darkness can make even familiar surroundings seem foreign and dangerous. Elevators may cause problems for those who may not realize that they are claustrophobic until the elevator stops unexpectedly. Restaurants and cafeterias have a specialized need when it comes to power. Backup power that goes to the refrigerator and freezer of the food storage area will ensure that no food has to be thrown out. At UPSRental, we specialize in getting you a backup generator that you can use for as long or as short a time span as you want. If you know that there may be a power outage due to nearby construction, or you need to have power during a natural disaster, we are there for you. When you rent a generator, you also get the peace of mind knowing that regardless of what happens to the power supply, your company will still be able to do its work almost uninterrupted. Contact us for a quote on what it would cost to supply your power needs with a rented generator. In the long run, you will be surprised at how much you save when you get a backup generator.